The Financial Crimes Enforcement Network, (FinCEN) is a division of the U.S. Department of Treasury and provides a network or a means of bringing people and information together to fight the complex problem of money laundering. The mission of FinCEN is to support law enforcement investigative efforts and foster interagency and global co-operation against domestic and international financial crimes; and to provide U.S. policy makers with strategic analyses of domestic and worldwide money laundering developments, trends and patterns. FinCEN works toward those ends through information collection, analysis and sharing, as well as technological assistance and innovative, cost-effective implementation of the Bank Secrecy Act (BSA) and other Treasury authorities. The FinCEN Patriot™ is an application that is designed to help financial institutions and other government mandated industries to be in compliance with the regulations of the USA PATRIOT Act and other governmental regulations. These laws require that all U.S. financial institutions must monitor all financial transactions performed by or through them to detect those that involve any entity or person subject to the FinCEN 314(a) laws and regulations. The FinCEN Patriot™ provides the ability to be in compliance with these regulations in the most cost-effective and least time consuming manner. The FinCEN Patriot™ is based on .NET technology and is a database-matching engine that allows for single entry searches of existing client and/or new applicant entries, as well as entire client databases, against the U.S. Department of Treasury's FinCEN provided database. This "user friendly" software application has an Update FinCEN Files function that allows you to expeditiously import the routinely updated information you receive via email from FinCEN that contains the Person List and the Business List files of information. 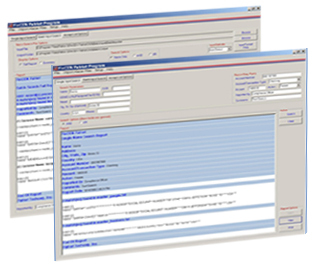 The FinCEN Patriot™ is currently available in a Windows, Multi-Batch and .DLL versions. In order to download a no-obligation, 10-day trial evaluation version of the FinCEN Patriot™ program, please click this link and select the program and version that is suitable for your application: link.